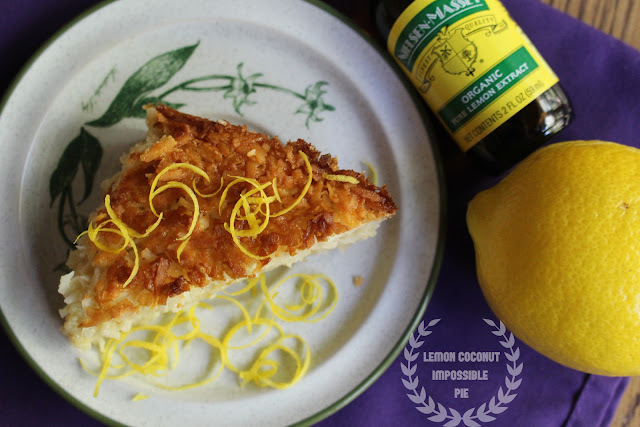 Lemon coconut impossible pie. I make impossible pie as my personal dessert treat at least once a month. I'm all for variety, but sometimes, as soon as I finish one, I make another. It's just so delicious. I usually make it exactly the same way--I could do it in my sleep at this point--but when Nielsen-Massey offered to send me some of their Organic Pure Lemon Extract to try, I decided it was time to make a little change. Surprise! Sometimes change can be good! And this was very good. 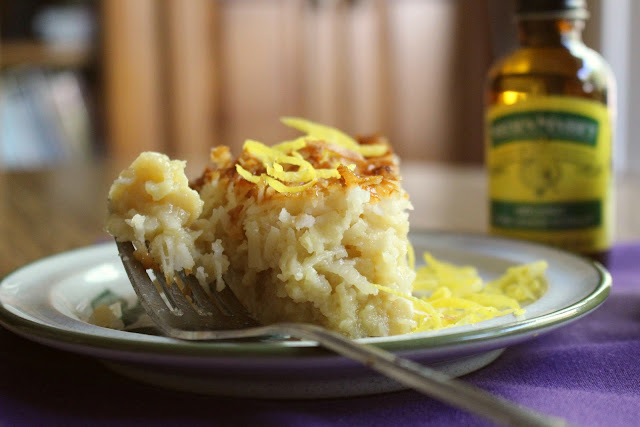 The lemon extract, which is made from California lemon oil and rounded out with peel notes, added such a bright burst of sunshine (as it is wont to do) and made my favorite dessert extra refreshing and flavorful. I won't lie--I'll probably go back to the original next time, but this is a good alternative to have in my back pocket! Preheat oven to 350 degrees F. Grease a 9- or 10-inch pie plate (an 8x8-inch dish works too!) with cooking spray. In a medium bowl, beat the eggs and add in the cooled, melted coconut oil or butter. Blend in the sugars, flour, and salt, then whisk in the milk and extracts until thoroughly mixed. Stir in the zest and the coconut, then pour into the prepared dish. Bake 40 to 50 minutes or until the coconut becomes golden brown on top and a knife inserted into the center comes out clean. The temperature inside should be at least 170 degrees F.
Let cool on a wire rack, then cover and refrigerate--it's best served well-chilled. lemon and coconut are a natural pairing...Very nice dessert. I would love a slice with my tea now, Grace. Looks really delicious! I love anything with lemon so I know this would be great. I love all things lemon, especially with coconut. This sounds delicious! Love their extracts! This pie has me drooling. Bookmarked. I am always smitten with any sort of lemony dessert and this pie is no exception! I've never made an impossible pie before but you had me at lemon! Throw in all that coconut and the fact there's no pie crust to deal with (I make the worst, dry, cracked, awful pie crusts) and I can't wait to make this stunner. I've been hanging onto a bottle of Nielsen-Massey's lemon extract for a few months with no clue what to do with it - thanks for the yummy AND easy recipe. Mmmm! And I love the idea of a monthly personal dessert treat! I used to make Impossible Pie with Bisquick. That was about a million years ago, but still. Yours with lemon sounds delightful! It looks very good and I am very tempted to make a pie that you like so much to make it all the time. It seems we all love lemony things so count me in for a slice of this cake. Lemony coconuty goodness sounds perfect! And, I'm wondering why I've never made an impossible pie. Need to make this. Oooh, coconut and lemon sound delicious, what a great pairing.